Disney's All-Star Resorts - Is Staying on Property at Disney Affordable? Disney All-Star Resorts offer economical and magical lodgings on Disney property. All-Star Resorts includes three independent yet uniquely themed resort hotels – All Star Movies Resort, All Star Music Resort and All Star Sports Resort. Each resort contains a main hall which contain welcome desks, general stores, food courts and arcades. Walls inside these hotels are lined with autographed photos of celebrities hence the name “All-Star Resorts”. And the fun doesn’t stop there! 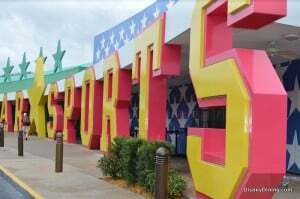 Outside you’ll find music, movie and sports icons like an enormous walking broom from Disney’s Fantasia carrying buckets of water too the pool at All Star Music, and a “Mighty Ducks” themed pool area at All-Star Sports Resort. If you’re a music lover, All-Star Music is decorated with giant guitars, fiddles, banjos and cowboy boots in its’ Country Fair section. Its’ two pools are shaped like a guitar and a grand piano Your kids will love a how Donald Duck and Panchito douse swimmers with a splash of water. Disney’s All-Star Resorts have 5,568 guest rooms and amongst them are 192 family suites which contain 2 baths. Suites sleep up to 6 people. Disney buses afford easy access to all parks and Downtown Disney. On a popular travel site, over 2,000 guests gave this resort 4 out of 5 stars and commented on the excellent quality and cleanliness of the rooms and the pleasant and accommodating staff. Rooms are small and furnishings are simple as you would expect from a budget hotel. Basically, if you want the convenience and fun of staying on Disney property but need to stick to a budget, this is a great option. Standard Room in the value season starts at $88 a night and in peak season increases to a base price of $135 a night. Family suites start at $202 a night in the value season and increase to a base price of $309 in peak season. NOTE: Prices subject to change. Consult Disney.com for updated princing.